This charming, grubby little 1860s white brick church is undistinguished in all respects except one. It is the most easterly church in the British Isles. It was built as Christ Church, but also given the fuller title of 'The Cunningham Memorial Beachmen's Church for the Beachmen and Fishermen of Lowestoft'. Francis Cunningham had been Vicar of Lowestoft for 45 years, and raised the money for the construction of this church. He died shortly before its completion. It was intended to serve the Lowestoft Beach fishing community on the Denes, that area below the cliff of Lowestoft's High Street. Their tiny rows of mainly 17th and 18th century fishermen's cottages, smokehouses and net yards were joined to the High Street above by a series of steep, narrow lanes called the Scores, some of which survive today. But everything else has gone. Although the area is usually called 'the Beach' or 'the Denes' in guidebooks, it was known as 'the Grit' by those who lived there, and had a population of 2,500 in 1900. It was probably East Anglia's poorest urban neighbourhood. For a moment, stand outside of Christ Church, and imagine how complete this destruction has been. If H. Oldham Chambers, the grandly named architect of the church, could come back and see it, he would be utterly gobsmacked, if it is possible for a 19th century architect with such a grand name to be gobsmacked. Today, Christchurch is swamped by the industrial and commercial wasteland which surrounds it; the carpet warehouses, car exhaust workshops, DIY superstores. The fishing industry survives in the form of the vast Birds Eye fish-processing factory, which spreads along the block beyond the church. It takes an effort of will to conjure up what was here before. For fifty years, this little church served its community quietly and faithfully, until the Zeppelin raids of 1914-18 devastated the houses of the fishing community. In the 1930s, the Lowestoft Corporation began to declare the area 'unfit for human habitation', those words often used to justify wholesale demolitions. Some rows were replaced with soulless council blocks. But then the Germans came back, and the area was extensively bombed. Perhaps the worst destruction of the Second World War occured when evacuated homes were used for training at house-to-house fighting, in preparation for the D-Day landings. The War changed the Grit forever. And even as the second lot of repairs were underway, Lowestoft's oldest enemy invaded. In 1953, the sea flooded into the land, killing scores of people in Suffolk, and undermining buildings all along the coast. Christ Church was flooded for days. By the 1960s, the only people left living 'on the Grit' were people who could not afford to live elsewhere. Many of the properties were being rented out cheaply, no questions asked. The last of the area's twelve pubs closed in 1968. No doubt the community had had enough. The collapse of Lowestoft's fishing industry in the 1970s only accelerated matters. Today, hardly anyone lives in the parish at all. For all that, Christ Church remains in use. This may be put down in part to its fiercely evangelical tradition; it has always had the character of a mission church, and the Minister would often preach outside the building, under a lamp-post in the intriguingly named Anguish Street. 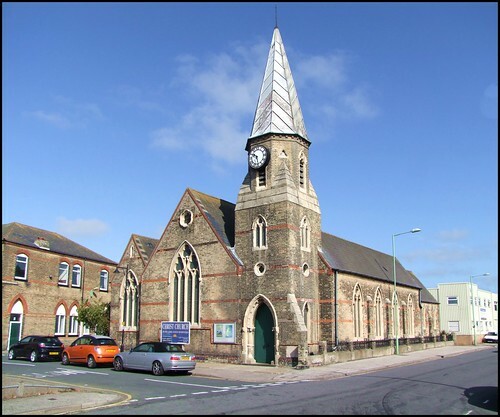 Perhaps, also, Christ Church was in better condition than nearby St John and St Peter when the time came in the 1970s to make two of Lowestoft's three 19th century town centre churches redundant. Although, it is worth pointing out that Cautley's editors set the entry for this church in the past tense in their 1982 supplement, to match the other two; clearly, they presumed it would soon follow St John and St Peter into oblivion. The roads go close to Christ Church on all sides, but I stepped into the building through a little porch on the west side - actually, the liturgically north side, as this building points towards the north rather than the east. Sensibly, this main entrance faces away from the sea: I came here for the 2009 Historic Churches Bike Ride, and even on this bright sunny day the wind from the sea almost knocked me off. The interior is almost exactly the opposite of that at the near-contemporary St Mark Oulton Broad a mile or so away - here, the low roofs and the wide aisles beyond their arcades create a delightfully crowded feel, as if this was a hobbit church, and you had to lower your head. It must seem very busy when it is in use. The elegantly stencilled chancel arch leads through into a small, jewel-like chancel, with what I suppose must be the most easterly stained glass window in the British Isles. I turned and walked back down the church, towards the most easterly font in the British Isles, the most easterly drumkit in the British Isles (did I mention that Christ Church is in the Evangelical tradition?) to chat with the most easterly Bike Ride Day welcomer in the British Isles. The superlative nature of the building was beginning to make me feel a bit dizzy, but the man on duty was very friendly, as I find Lowestoft people almost invariably to be. He told me that the church, although kept locked, can easily be visited by calling at the office across the road. He also told me quite how much he enjoyed visiting churches like I do, despite the fact that he didn't really believe in God, which was candid of him to say the least.